QueBIT Blog: Cognos Analytics Upgrade - Avoid downtime! When IBM announced the termination of support for Cognos Business Intelligence 10.2.x as of April 2018, the logical consideration followed to potentially upgrade to Cognos Analytics 11. Doing nothing is not an option, as once Cognos 10.2.X reaches end-of-life, your organization would risk downtime with no options for support. Cognos Analytics now provides a more streamlined interface for users. This feature provides added value in shortening the learning curve for current 10.x users, as the new interface is a more intuitive tool, while preserving legacy functionality. 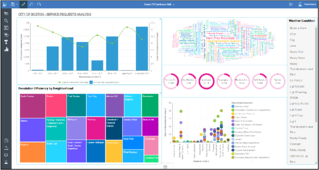 In addition to the improved, more interactive experience for the report consumer, Cognos Analytics enables analytics developers to quickly, efficiently, and repeatedly deliver high impact intelligence. The interface improvements include a much better use of visual space for the user, through minimizing icons & menus, and contextually presenting features & functionality. This approach also makes the new interface far more productive for the advanced developer, as those capabilities are now more readily accessible. Using the new graduated capabilities and edit mode, developers can get access to all the toolbox items, data packages, report pages, queries etc. One major improvement worth noting - as soon as a report or dashboard is saved in Cognos Analytics, it becomes immediately accessible via the search functionality – this eliminates indexing! Data discovery is further supported by a much-improved offering of template based, report starting points. These templates are all designed using best practices and provide optimal presentation options to promote deeper analysis of the data, while utilizing more modern visualizations and enhanced chart types to offer new ways of evaluating data. Data sources are immediately accessible for exploration. If your situation ever requires use of a previous release, it is now possible to run Cognos Analytics in “Legacy Mode”, which will enable all the tools/functionality found in version 10 for a variety of applications. QueBIT can help you leverage the Cognos 10 skillset of your users and preserve your core reporting functions, while seamlessly upgrading and integrating Cognos Analytics 11 for your organization.